1. Read the book. You wouldn’t suggest a restaurant to a loved one without eating there first, right? Same goes for books. If you can’t read the book (no time, it’s checked out of your library, etc.) try and find a good review. The New York Times is good, and they just came out with their 100 Notable Books of 2011. Other resources are Publisher’s Weekly and Booklist. For the kiddos, look at The Horn Book or School Library Journal. Or ask your librarian. Librarians love to suggest books. 2. Spy on your loved one. Does your mom have a stack of romance novels? Is your boyfriend a horror fan? Peek at the bookshelf of the person you are buying for, or ask someone else to peek if the person doesn’t live with you. For example, my dad fancies himself a mariner, so I got him The Devil’s Teeth, about sharks. He loved it! Epic gift win. You can also look up a title they’ve enjoyed on Amazon, which will then suggest other books that are similar. You can also see if your local library subscribes to NoveList, or use free services like GoodReads or LibraryThing. 3. Shell out for a nice copy… Go for the hardcover, people. It’s easier to wrap, first of all, and just seems more gift-y than a paperback. Inscribe the book with a note. Cut off the corner that has the price on the dust jacket. “But then I can’t return it if they don’t want it!” you exclaim. If you successfully completed steps 1 and 2, you shouldn’t worry. They will love it! 4. …but don’t go crazy. Unless the person you are buying for is absolutely totally 1000% into a topic, you don’t need to go overboard. If your favorite uncle is a Shakespearean scholar and you found a first folio with Billy Shakes’ autograph, and you have a zillion dollars to buy it, then by all means go for it. However, if you go to your local library, they usually have an ongoing book sale and you can get very very gently used hardcovers for five dollars or so. This is also a great resource for buying children’s books. Be merry, and be bookish. This entry was posted on Tuesday, November 29th, 2011 at 11:47 pm	and tagged with books, gifts, holidays, shop and posted in General, The Reading Life. You can follow any responses to this entry through the RSS 2.0 feed. Fantastic advice!! I especially agree with #s 1 and 2. I have heard horror stories about people thinking a book is appropriate for a certain giftee, and then finding out it’s the exact opposite book they should have gotten. The geunis store called, they\’re running out of you. In December of 2009, Amanda Lanyon-LeSage said something on Facebook that could possibly change the world. She merely wished that she could take a day off and do nothing but read. Her idea was seconded–and thirded and fourthed–and then it happened for real. 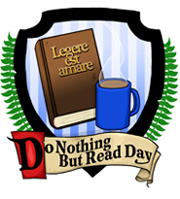 The first Do Nothing But Read Day was held on Sunday, December 20, 2009. The most recent took place on Saturday, August 6, 2011. Stay tuned for more DNBRDs in the future!